The projects for which we require donations are below. Monetary donations can be made towards any project you request. If you or your company can donate time, materials or resources to help us complete these projects, we would appreciate you contacting us. We are a 501 c 3 charity through NAMI of Greater Toledo. 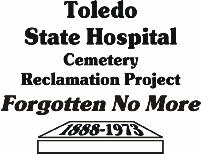 TSH Cemetery Reclamation Project t-shirts are on sale for $10 each. Support TSHCRP, and as you wear this striking t-shirt, be an advocate, and bust the stigma of mental illness. T-shirts were designed by Dan Graham and produced by Advance Advertising of Toledo. See details below. 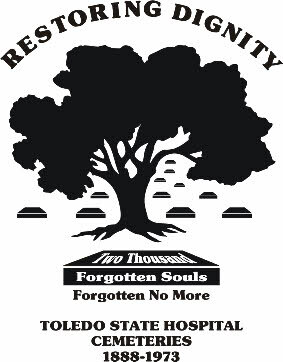 For those interested in being a visible supporter of this project, we are pleased to announce the availability of Toledo State Hospital Cemetery Reclamation Project t-shirts, printed by Advance Advertising of Toledo, with our new logo designed by Dan Graham. T-shirts are available in sizes S-5X. The t-shirts can be bought for $10 each for sizes S-XL and $12 each for sizes 2X-5X. Proceeds will go to funding of our projects. To order, contact us through our e-mail address tshcrp@buckeye-express.com. Front and back of the t-shirts are shown below. Design is white on navy blue or cranberry on heather grey. If you can help with materials or manpower for any of these projects, please contact us at tshcrp@buckeye-express.com. 4. Beautification : other items on our list for the old cemetery include brick structures to define the site corners, benches, fencing, off-road parking, a pathway with a buy-a-brick theme, a paved area around the memorial and a walkway to an overlook located by Swan Creek. Contact us if you can help with any of these projects. 5. Materials for cemetery upkeep - Sponsored by UTMC. 2. Ohio Historical Society Signs : Sponsored by UTMC. 3. Granite Memorial in Old Cemetery : Sponsored by Ohio Department of Mental Health. 4. Records Research and Documentation: Sponsored by Northwest Ohio Psychiatric Hospital. 5. Brochure Improvements : Sponsored by the Ohio Department of Mental Health and by private donations. 5. Flag Pole in honor of veterans in Old Cemetery: Paid for by Lucas County Veterans Association. 6. Display Board for displays about the cemetery : Sponsored by private donations. and University of Toledo. Watch for the maps on our website in the near future. 8. Mapping the cemeteries : GPR of areas in which we are having trouble locating markers, particularly in the old cemetery. Provided by Ground Penetrating Radar Systems Inc.
1. Pathway:: Construction of a path to the east of the treeline along the Bowsher HS side of the cemetery. 2. Outlook: Construction of a path to the west of the cemetry to allow ccess along a new paathway to an outlook over Swan Creek. 2. Replacement of trees: taking out dead trees in both cemeteries and replacing with donated Eastern red cedar trees. 5 trees need replacing immediately and a further 10 will need replacing within the next 2 years. 3. Panels for the old cemetery: Panels will contain the names of those buried there, taken from the State Hospital burial log.